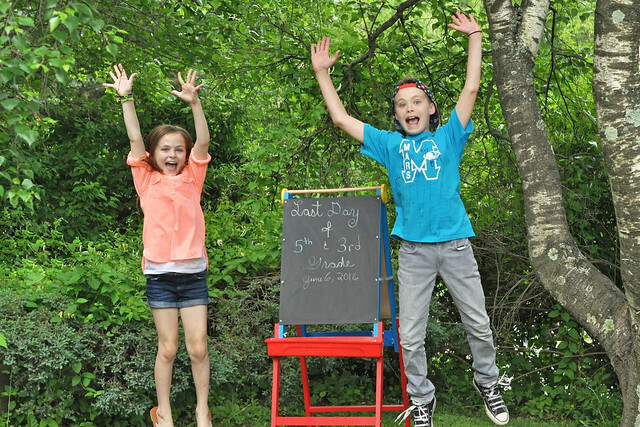 It's official: School's out for the Summer! It was easily the fastest school year ever! I mean, I swear they just started. But as of 3:50 PM, Dylan and Lexie joined Lily and Liam on Summer Break. They reluctantly said their goodbyes to their friends and their absolutely amazing teachers, and they headed home for a Summer full of fun! 5th Grade was a tough transition for Dylan AND for me. Everybody warned us, but I guess I was in denial. 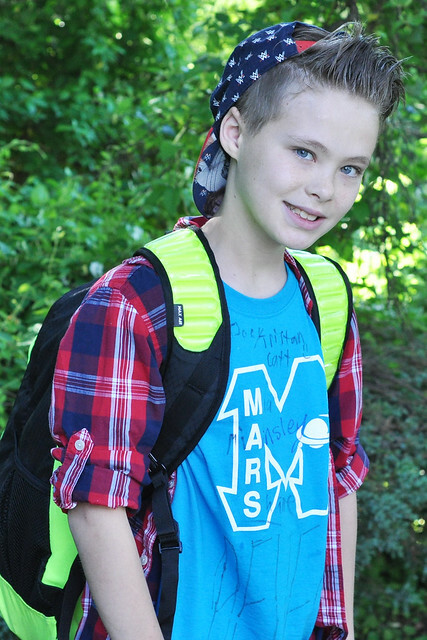 The work load was intense and Dylan's great grades didn't come as easily this year as they have in the past. Dylan had to work hard to get good grades. He had to learn organizational skills and he HAD to study. It was a wake up call for both of us and it took several months before he found his groove. I found myself, along with many other friends walking this path for the first time, often saying "I HATE 5th Grade!!!" In our school district, the 5th and 6th grade building is very much like a junior high. The kids are starting to join cliques and the rules are strict. School isn't as much fun anymore because it isn't elementary school. If I'm going to be completely honest, I'm not a fan of this setup. 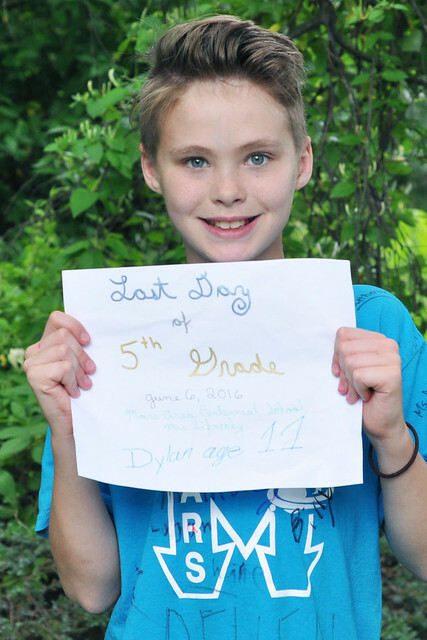 Kids in 5th and 6th grade are still kids and I feel like Dylan was forced to grow up faster than he should have this year. I really did notice a difference between him and family members and friends his age who were attending a traditional K-6 school. This year was about his clothes, his hair, how he looked, and girls. I certainly wasn't ready to deal with that stuff THIS early! Thankfully, Dylan enjoyed going to school. We had a rough patch at the beginning, but he soon adjusted. He had great friends and he adored his teacher. 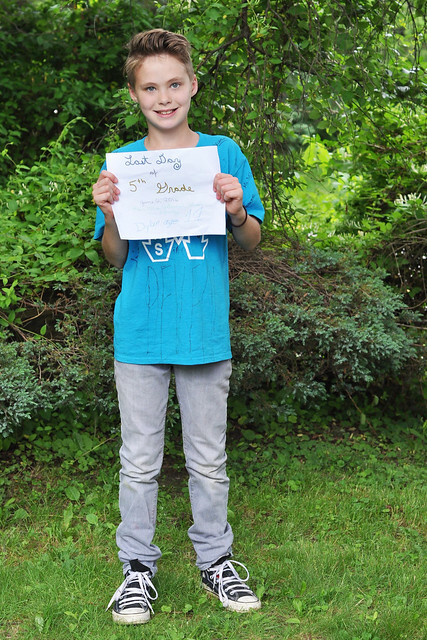 He had an incredibly supportive teacher who helped him out along the way. I can only hope that one of my other children is lucky enough to have her for a teacher someday! 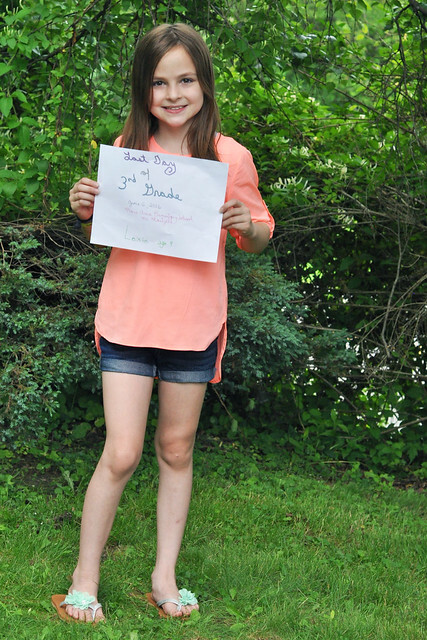 Lexie, on the other hand, breezed through 3rd Grade! Lexie loves school! On the two days that we forced her to stay home because she was sick, she begged to go. It definitely helped that she had an awesome teacher who made each day fun! Lexie excels at school. 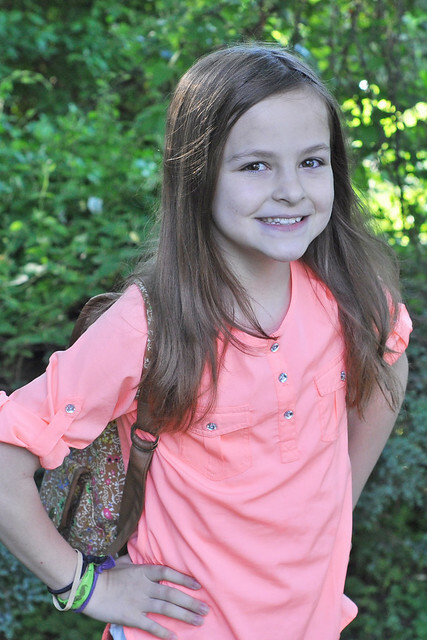 She was a "model third grader" according to her teacher and she took pride in her hard work and excellent grades. Lexie came home with fun stories to share about her teacher and her friends each afternoon and was excited to go to school every single day. Any teacher that can inspire a child in that way is a hero in my book! I'm really hoping that Lily and/or Liam have him as a teacher in the future. If only every teacher Lexie gets could have his dedication and enthusiasm! 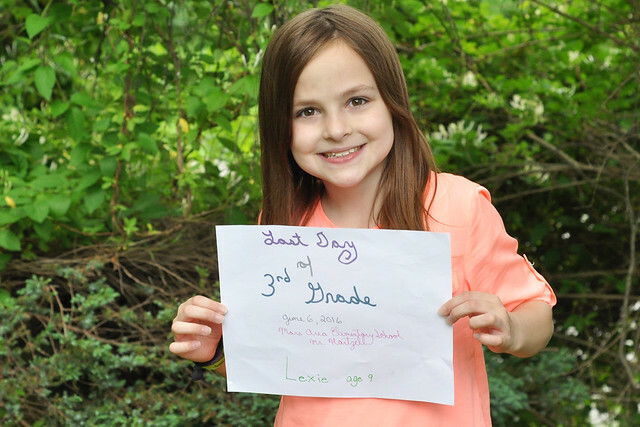 It was an amazing school year for Lexie! I'm so proud of BOTH of my kids for their hard work this year. When I looked at them before they headed to school this morning, I couldn't help but wonder, "Where did time go?" They truly looked so grown up and it happened in the blink of an eye! 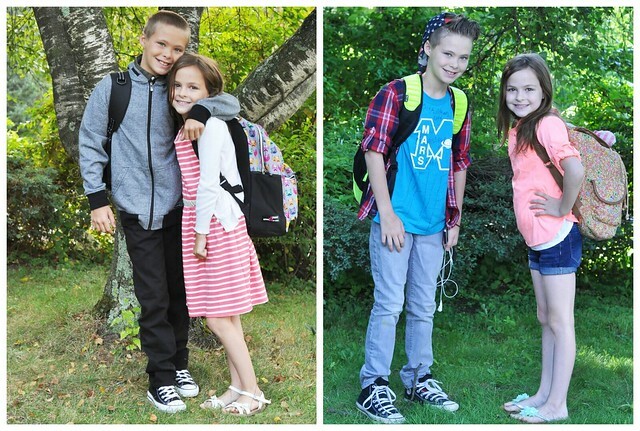 When I did the traditional first day of school/last day of school comparison, the changes were evident. Especially with Dylan! Who are these big kids and where did my babies go?!? These big kids got off the bus this afternoon and their enthusiasm was lacking. Dylan's tween attitude was in full force. He's just too cool these days. He thrives on going to school and seeing his friends, but he was too cool to admit that he would miss his friends and his teacher. Lexie was crying because she ALREADY missed school, she missed her friends and she missed her teacher. She just didn't want school to end and her emotions were spilling over. I just stood there, completely stunned. 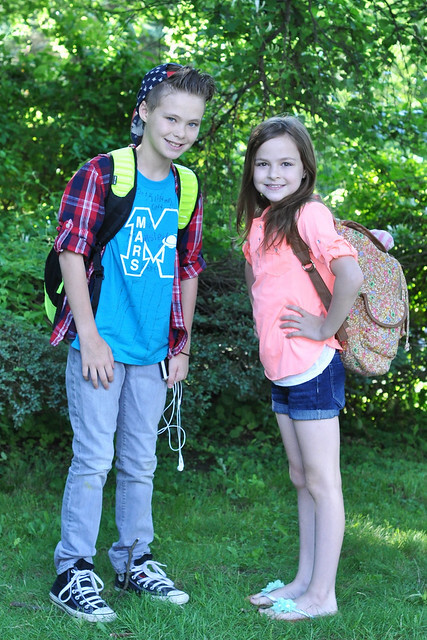 Where was their last day of school excitement??? But I get it. I understand how difficult it is to say goodbye to something you know. They trusted and loved their teachers and felt completely comfortable in their classrooms. It's hard to face the unknown of another year ahead of them and only hope that they win the teacher lottery again. I get it, because that's how I feel, too. I liked how things were. Time is moving entirely too quickly and I'm trying desperately to hold on to life as it is at this very moment and I'm not succeeding whatsoever. Time...and my kids...are slipping out of my grasp much faster than I like. But that's the point of raising kids, isn't it? It's incredibly bittersweet. You want them to grow and thrive but it's just so hard to let go of the past. And here we are. 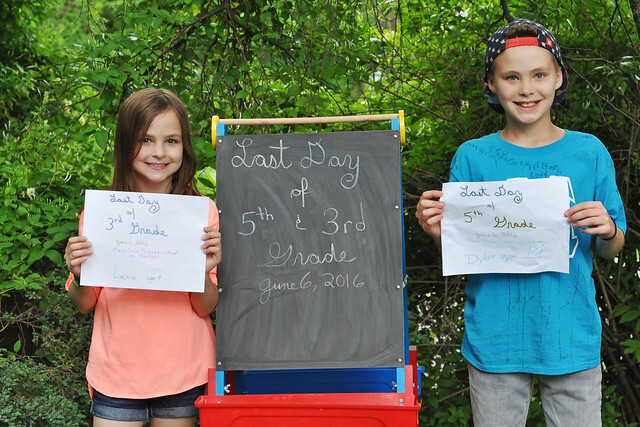 5th Grade and 3rd Grade are officially over. It seemed like decades before we would reach this point and now I'm just wondering where time went! I'm looking forward to Summer Break with my kids. I just want to spend time with them and enjoy the NOW. I just hope I don't lose my sanity along the way...I'm just keeping it real. I have three kids camping out in our living room for their first night of Summer Break. The oldest two bickered all afternoon. The tween couldn't control his attitude and lost his iPod. The 9 year old cried all evening about school being over. The toddler is trying to fight off a fever. In the morning, my niece will be arriving to spend the day with us. And did I mention that it's now 3:30 AM? In just a few hours, Camp Mom is about to begin! My kids, and their cousins and friends who will be spending most weekdays with us (I told you I was crazy), have a fun Summer ahead of them. I've been browsing my Pinterest boards, writing down ideas, shopping for supplies and loosely planning our weeks. I tried to stick to the same plan each week: Two outings, one craft, one recipe and one DIY activity. It was a lot of work, but I managed to come up with enough ideas for each Summer weekday plus a few extras, just in case! The best part is that none of it is time-consuming and most things can be done at any time throughout the day! Stay tuned...I'll be sharing the project next Tuesday and I'm going to attempt to recap each week of Camp Mom fun throughout the Summer! My hope is to make memories with my kids over the Summer and enjoy each day. Before I know it, Fall will be here and all FOUR of my kids will be heading to school. I'm holding on to the now with all my might! ALL FOUR KIDS IN SCHOOL. I can't even think about that without crying! Motherhood is a tough gig! Love their last day pictures! Sweet Lexie for crying that the year is over. Love her. So 5th grade is something I need to look forward to huh? 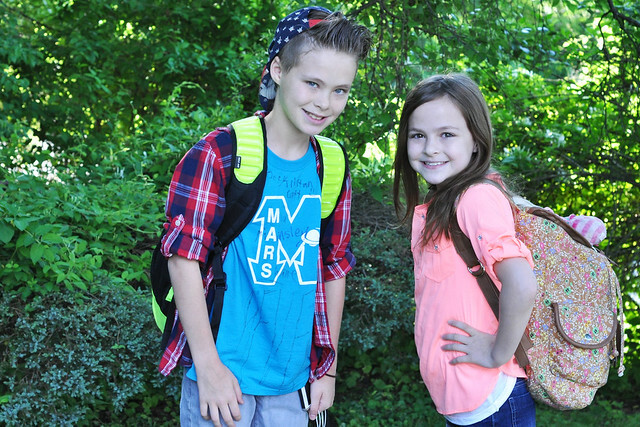 What a big change for Dylan and goodness the tween stuff is for real. My aunt claims it crazy. You are going to have your hands full this summer, but it sounds like a lot of fun. Can't wait to see what all you do. 5th grade is TOUGH! Definitely the toughest year so far. Age 11 is also the toughest age. I would rather deal with 10 newborns than a tween with an attitude! Isn't it just so bittersweet!! I love summer almost as much as my kids do. No waking up to an alarm clock, no homework, no packing lunches. I can't believe how fast the time is going these days. Love these pictures! I was SO excited to pack away the lunchboxes for a few months! Great pictures! You are exactly right; parenthood is so bittersweet. I spend half of my time waiting for the next step in their life and half of my time wishing we were in the previous stage. I really need to live in the moment. I hope you guys have a great summer and Camp Mom is super successful! That is exactly right! I feel the same way. Let's see if I survive Camp Mom! Dylan sure did mature from the beginning of the year. Wow. Lexie is as adorable as ever! Can't wait to see what you have up your sleeve this summer! I'll be sharing week one on Tuesday...I hope! Ha! Feel free to swipe away. I tried to add in activities that we have never done before to keep things fun! His hair is SO different. I think I'd agree with you too on not loving the set-up. Let them be little as long as they can! Good job kiddos! Enjoy your summer. Little is easier! Trust me. This is new territory for me and the tween hormones are tough to deal with! Love your realness! I have four and the oldest 2 boys are almost 10, and almost 11 and it is tough. Attitude one minute and kind and sweet the next. I also have an emotional 7 year old girl and our 4 year old has spastic quad cp so it is always interesting!! You are a great momma and thanks for always keeping it real! Oh my goodness, you have your hands full! That's what bothers me the most about the tween stage. He can be so sweet and mature then turn into tween with an attitude the next minute. I don't get it!!! Thank you so much, Chrissy! XOXO He had his first "face-time date" with a classmate today. I didn't realize what it was until I saw him in action. I am not ready for this one bit! Wow, Dylan changed SO much this year! I didn't realize how much more mature he looked until I saw your comparison pics! You are so right - parenting is so bittersweet! I didn't notice it until then, either! 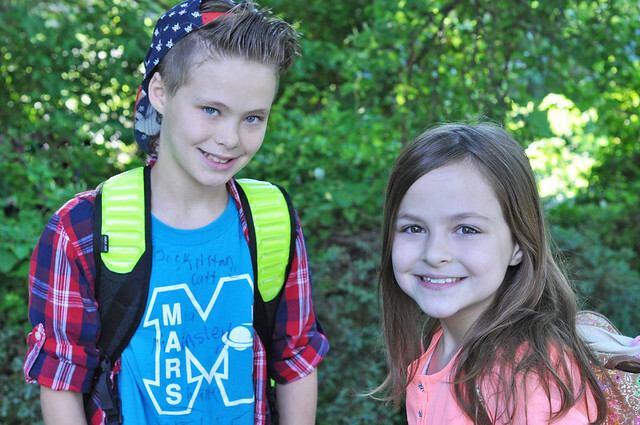 These kids are growing up too fast!